It is an interesting letter to consider for those probing the social implications of the gospel message. N.T. 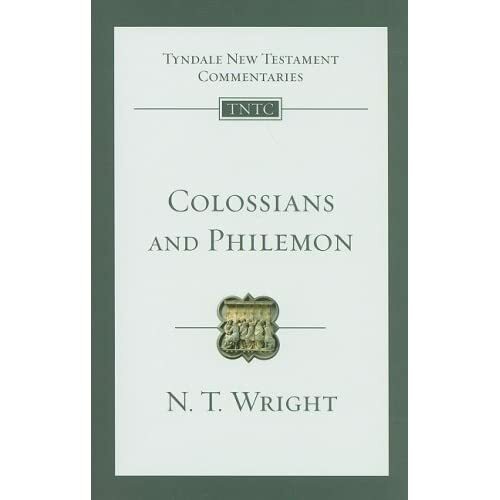 Wright’s highly engaging and astute commentary in Colossians and Philemon recently re-released by Intervarsity Press, offers a great starting point for those consideration. I think this is one of the most engaging biblical commentaries I’ve ever read. Wright is exceptionally clear in his writing and thinking. I want to get this out of the way before I say anything more: get a copy of this book. You can find it for less than $11 at Amazon, and it’s well worth the money to better understand the Word of God from an accomplished and respected scholar like Wright. It is a part of the Tyndale New Testament Commentary series, a series of affordable and understandable (i.e., you don’t have to be in seminary) commentaries currently under the IVP imprint. Wright’s choice of these two letters is quite appropriate, as Philemon was a resident of Colossae and it is likely that the letter to Philemon accompanied the letter to the Colossians. Why did Paul not simply ask for Onesimus to be released from slavery? Why (for that matter) did he not order all Christian slaveowners to release all their slaves, rather than profit from an unjust social structure? Slavery was one of the really great evils of the ancient world, under which a large proportion of the population belonged totally to another person, for better or (usually) for worse, with no rights, no prospects, the possibility of sexual abuse, the chance of torture or death for trivial offences. Some slaves were fortunate in having kind or generous masters, and by the end of the first century some secular writers were expressing disgust at the institution. But for the great majority, life was at best drudgery and at worst “merciless exploitation’. Why, then, did Paul not protest against the whole dehumanizing system? What alternatives were actually open to him? He was committed to the life, and the standards, of the new age over against the old (Col. 3). But a loud protest, at that moment in social history, would have functioned simply on the level of the old age: it would have been heard only as a criticism by one part of society (Paul, not himself a slave-owner, had nothing to lose) against another. It would, without a doubt, have done more harm than good, making life harder for Christian slaves, and drawing upon the young church exactly the wrong sort of attention from the authorities. If Paul is jailed for proclaiming ‘another king’ (Acts 17:7), it must be clear that thekingdom in question is of a different order altogether from that of Caesar. In addition, inveghing against slavery per se would have been totally ineffective: one might as well, in modern Western society, protest against the mortgage system. Even if all Christians of Paul’s day were suddenly to release their slaves, it is by no means clear that the slaves themselves, or society in general, would benefit: a large body of people suddenly unemployed in the ancient world might not enjoy their freedom as much as they would imagine. Paul’s method is subtler… like Jesus, his way of changing the world is to plant a grain of mustard seed which, inconspicuous at first, grows into a spreading tree. And in the meantime… he teaches slaves and masters to treat themselves, and each other, as human beings. Hmm. I think it is the particular sin of some Christians to neglect to see the forest for the trees. They spend so much time on interpersonal relationships that they never think about the broader implications of a just society. Perhaps, for the young radicals among us, a particular sin is present: we tend to want to keep guard over the forest, hovering above in a helicopter, without ever touching down to find out the trees are dead. What good is it if Onesimus is freed under compulsion, without ever reconciling with his master, and Philemon learning and accepting that the slave is his brother? Without doing the work of glorifying Christ through sacrificial love, isn’t Philemon just another tree in the forest: seeming alive from afar but spiritually dead? God appoints seasons. Some seasons call for seeds to be planted. I couldn’t agree with N.T. Wright more on that point – Paul plants a seed. That seed led to the freeing of one slave. That slave, Onesimus later became Bishop of Byzantium and began collecting the books of the New Testament (Wright contends that there is no evidence for this…however, the story has been preserved in tradition, and it’s a story I quite like). That New Testament led William Wilberforce to labor for decades to abolish the slave trade in England. It led Martin Luther King to fight for the right to be an equal with whites in America. Are we young radicals crying out at a forest of dead trees, when we should set ourselves to the task of planting seeds in that forest? Or is there room for both? Not having read this book, I still think it sounds kind of off. This is way too much explainifying to try to justify Paul’s words on slavery. Isn’t it vastly simpler and much more believable to simply state that Paul didn’t have any problem with the institution of slavery? It was such a constant & ubiquitous part of the Greco-Roman world. He never had any intention of “changing the world” as the world related to slavery. He seems to think that the world will end very soon anyway, so he really bothers messing with worldly institutions at all, even if in our modern post-Enlightenment perspective we can see terrible injustices in those institutions. It would seem to me that Paul implicitly recognized that the new kingdom inaugurated through Christ would break down the traditional societal barriers between men and women, slave and master, and races (Jew and Gentile). It would seem that Paul was giving Philemon the opportunity to do the right thing. And – because it was a personal letter to a friend – he had confidence that Philemon would do it. Hence, direct command wasn’t necessary. Where are the seeds of social justice for gay and transgendered individuals who, as the social slaves of the modern world, are being denied and oppressed by our literal and repressive religious convictions? Or are we already looking at dead trees? Indeed Wright is spineless here. Evil is evil, even of the former slaves would be less jobless. Paul compromised here, he wasn’t just subtle, he totally missed an opportunity to make his views known to Philemon, instead he goes with the staus quo. I am sure some slavemasters treated their slaves nicely, but that certainly does not make it tolerable, they were still owned by another human. Howard Thurman, the great civil rights leader and writer told of his relative who tore out the books of Paul in her Bible, and only read it without these, as she saw Paul as condoning slavery. I tend to agree with her.